In 1941 New York Times reviewer Bosley Crowther called tonight's film The Lady Eve a "fresh" and "ingenuous" comedy. Considering his glowing review, its hard to imagine that this witty romp would be any less entertaining to today's audiences. 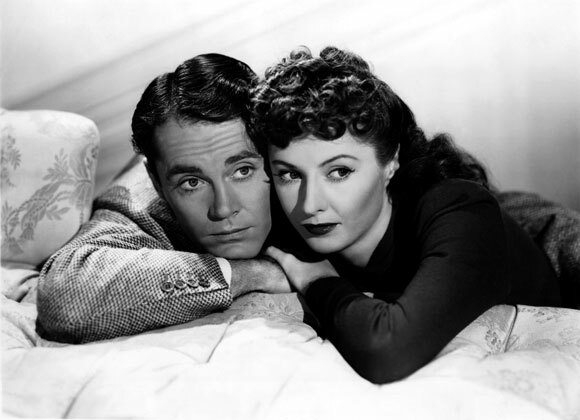 See Barbara Stanwyck and Henry Fonda tonight on the big screen in the park, and see for yourself if this Preston Sturges's film stands the test of time. Hard-of-hearing park visitors, please scroll to the bottom of the post for instructions on accessing titles for tonight's film. Now there's no question about it: Preston Sturges is definitely and distinctly the most refreshing new force to hit the American motion pictures in the past five years. The fact was thoroughly apparent—but almost too good to believe—when his rowdy comedy. "The Great McGinty," came along last Summer. Further corroboration was given it by his "Christmas in July." And now, with "The Lady Eve," which arrived yesterday at the Paramount, Mr. Sturges is indisputably established as one of the top one or two writers and directors of comedy working in Hollywood today. A more charming or distinguished gem of nonsense has not occurred since "It Happened One Night." Superlatives like that are dangerous, but superlatives like "The Lady Eve" are much too rare for the careful weighing of words. And much too precious a boon in these grim and mirthless times. For this bubbling and frothy comedy-romance, which Mr. Sturges has whipped up for Paramount, possesses all the pristine bounce and humor, all the freshness and ingenuity, that seem to have been lacking from movies since away back—we don't know when. Suddenly the art of comedy-making is rediscovered in the most matter-of-fact place. For actually Mr. Sturges has taken one of the stock stories off the movies' middle shelf—the old one about the man who falls in love with a lady of unsuspected sin—and has given it such humorous connotation and such a variety of comic invention that it sparkles and cracks like a pretty right out of a brand-new box. The lady, to be sure, is not a sinner with a great big capital S; she is just a delightful card-sharp who happens to be working the boat which picks up a wealthy young scientist fresh out of the Amazon jungle. And the way he falls for her—and eventually she for him—is a matter of magnificent consequence with Mr. Sturges directing it. Of course, there is the inevitable unmasking, the forlorn and vindictive farewell; but the lady has her day—and recompense for her broken heart—when she returns to delude the young man as an English noble miss. "The Lady Eve," in other words. And the screaming honeymoon sequence which Mr. Sturges has devised for the two in a flower-decked Pullman compartment is one of the most deliciously funny scenes ever put into a motion picture. Now you guess how it ends. The secret of Mr. Sturges's distinctive style is yet to be analyzed, but mainly it is composed of exceedingly well-turned dialogue, a perfect sense for the ridiculous in the most mundane and simple encounters, and generous but always precise touches of downright slapstick. No less than six flat falls are taken by the hero in this piece. And the manner in which action is telescoped and commented upon by fast and hilarious glimpses is cinema at its very best. You'll not see anything better than the suggestion of a whirlwind courtship which wins the Lady Eve. Likewise, Mr. Sturges has a genius for picking his casts. No one could possibly have suspected the dry and somewhat ponderous comic talent which is exhibited by Henry Fonda as the rich young man. And Barbara Stanwyck as the lady in the case is a composite of beauty, grace, romantic charm and a thoroughly feminine touch of viciousness. Other beautiful performances are contributed by Charles Coburn as a wry and lovable card sharper, William Demarest as hard-boiled bodyguard and gentleman's man, Eugene Pallette as a much-abused tycoon and Eric Blore as a confidence worker. But the picture is mainly Mr. Sturges's, and to him the chief credit is due. Perhaps it is somewhat academic to hail him as the American René Claire, but there is a delightfully reminiscent suggestion of that gentleman's early verve in his work. Mr. Sturges writes with a skimming but penetrating touch. He may have sacrificed a rib to the cause, but he has done the old Adam proud in his creation of "The Lady Eve." Connect to our official wireless network, BryantPark.org. Depending on the device you’re using, you will either automatically see our Terms and Conditions page, or you can open a web browser and attempt to browse in order to display the Terms and Conditions page. Read and accept the Terms and Conditions. You will be redirected to our splash page. At around 5pm, a link will appear in the “Today in the Park” section of that page directing you to the movie titles site. Click the link to access the titles. Your web browser will automatically refresh itself to display the dialogue from the current scene of the film. This system has been tested using the latest versions of Firefox, Chrome and Safari. This system is currently in the testing phase, and the slides are advanced manually by a live operator. If you experience technical difficulties, please contact a Bryant Park staff member. The title operator will be located under the Bryant Park umbrella near the projection trailer, on the Upper Terrace. We appreciate your patience during this pilot. At the end of the night, we welcome your feedback on the experience. Please email us at bpweb@urbanmgt.com.